For the 2019 season we will be opening on Tuesday 2nd April (weather permitting!) and closing at the end of September. 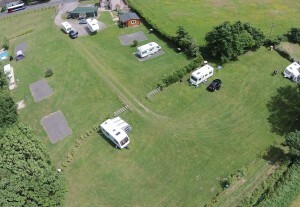 We have eleven pitches available for caravans or motorhomes – we can’t take tents. Five of our pitches are in a dedicated area of the site for Caravan and Motorhome Club members (formerly known as The Caravan Club). These are all grass pitches. Plus you will have one acre of space for just five vans – probably one of the largest pitches you’ll get! Then there are another six spaces for non members – five hardstanding and one grass. The photo below gives you a rough idea of the layout of the pitches. We have fresh water available for all our campers, plus a brand new, stainless steel chemical waste disposal point, and two toilets for use by campers. We also have two lovely shower cubicles (shower, basin and toilet). 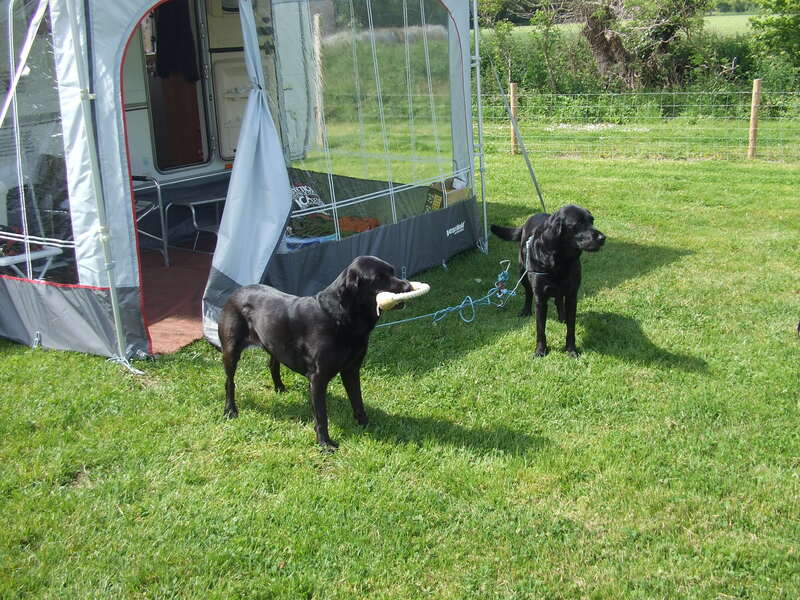 What’s more – we are dog friendly but ask that all your four-legged friends are kept on leads while on site. Note: We understand that you may receive day visitors while you are with us – but we would ask if you could check with us first before they arrive – this helps us to keep the site safe and secure for everyone. Additional people (aged 5 or over) per person, per night. Children under 5 can stay for free. We do not charge anything extra for dogs, or awnings. Note: We cannot make any one night bookings that fall over a weekend. Also we ask for a minimum of three nights to be booked for any Bank Holiday weekend or for dates that fall during the Goodwood Festival of Speed, or the Goodwood Revival. We ask for full payment in advance for all Bank Holiday weekends and for the Goodwood Festival of Speed and Goodwood Revival events. For bookings during July and August we ask for a minimum payment of 50% – at least eight weeks in advance of your arrival date – which can be made either by cheque, or using online banking. Note: We cannot accept card payments. – Your best telephone contact number (preferably a mobile number)? – A rough idea of your arrival time so that we can look out for you? (Arrival can be anytime between 12 noon and 8pm). If you are a Caravan and Motorhome club member please also provide your membership number. Once we have received your details we will email you a booking confirmation, which will include payment details as appropriate. And if you haven’t tried out a motorhome yet – have a trial run with Landcruise Motorhome Hire (Chichester) – we bet you’ll love it!